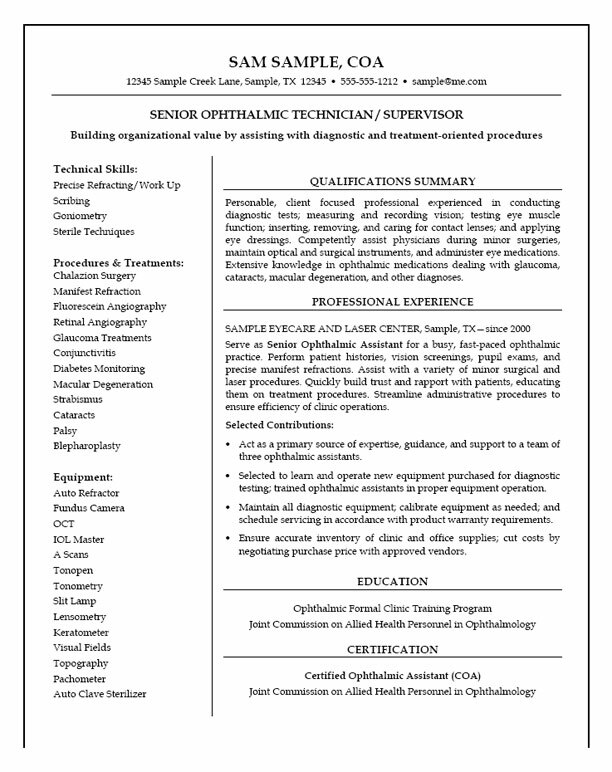 Medical Technician Resume Example for professional with experience as Ophthalmic Technician and Supervisor for a Laser Eye clinic. This resume uses an unique style with a job title at the top with a headline statement that emphasizes value in assisting with diagnostic procedures. The qualifications summary is in paragraph form on the right hand side, which describes their overall experience and details of their job function that make them ideal for this position. All the way along the left hand side, the writer lists all their technical and procedural skills as well as a list of medical equipment. The professional experience section uses paragraphs to define their duties such as handling vision screenings, pupil exams and re-fractions. The selected contributions are written with bullet points to highlight key actions and achievements. The bottom of the resume provides a section to list their participation in an Ophthalmic training program and their COA certification. Prepare medical samples for chemical analysis. Operate various lab devices such as determiniators, centrifuge and spectrometers. Perform sample studies on SPC plotting devices. Record results and lab data on filed documents and computer databases. Maintain compliance with specific collection and testing requirements, protocols and regulations. Monitor samples and specimens for scheduled tests and discard dates. Perform preventative maintenance on equipment and destroy specimens that no longer meet quality requirements. Keep lab, testing area, devices and equipment clean and sterilized.